THE Presidential Suite at the Plaza Hotel in New York is one of them. One night's stay costs $15,000, according to the Travel Channel. Guess who stayed there in September, 2008 while attending the United Nations General Assembly as well as various meetings with businessmen, and a women's conference w/ former Secretary of State Condoleeza Rice? The caption is supplied by the Office of the Press Secretary and available on the OPS web site. 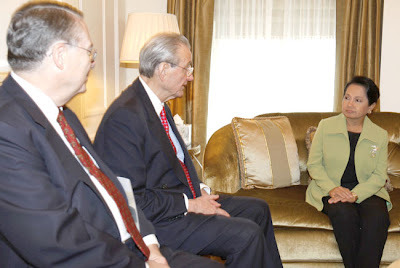 It says: "President Gloria Macapagal-Arroyo confers with (L-R) Citibank CEO Bill Ferguson and Citibank Chairman Bill Rhodes who paid a courtesy call on her Monday afternoon (Sept. 22, NY time) at the President’s suite at The Plaza Hotel in New York City. The President is in New York to attend the 63rd Session of the United Nations General Assembly (UNGA) and hold a series of meetings with world financial and political leaders. (Rey Baniquet/OPS-NIB Photo)"
Even Eloise, sweet child that she is, is bound to raise an eyebrow at this! The Plaza's presidential suite, although not cheap by any measure, is hardly the most expensive in the world. I believe it's the Ty Warner penthouse at the 4 Seasons New York at more than $35,000 a night. Lemme check that Anonymous 11:58 pm. But I was just quoting the Travel Channel. Thanks for the info! NP, but I do agree with the gist of your post that the government should be more circumspect in spending public funds. She could have stayed at The Waldorf Astoria (as she did recently) or even at St. Regis. Both charge around $10,000 a night at their presidential suites. Still eye-poppingly expensive but she saves $5k a night. Personally I'm not bothered by this as much as the meals. Wag lang sa Ty Warner suite sobra na yun talaga. "... at the President’s suite at The Plaza Hotel in New York City...". That could also mean at the suite of the President and not necessarily the Presidential Suite. I'm not at all familiar with any New York hotel, but, I do suppose the Plaza Hotel have other suites, too? Unless, there was a confirmation that I may have missed somewhere that they did stay in the PRESIDENTIAL SUITE. @Anonymous 8:12 pm. Yes, we independently confirmed that it was the presidential suite. She doesn't check in anywhere but. Thanks! I wholly agree that gross overspending by government agencies, worldwide, is an abomination, however, the world must realize that luxury hotels (including the one I represent) do NOT charge rack rate for these suites when notables arrive. In many/most instances the rate paid by these government notables are actually "government rates" or fairly reasonable "negotiated rates" and they are usually upgraded to these premier suites "gratis". This is a very standard occurrence in MOST luxury hotels---at least with the 3 top luxury companies I have worked for over the last 16 years.